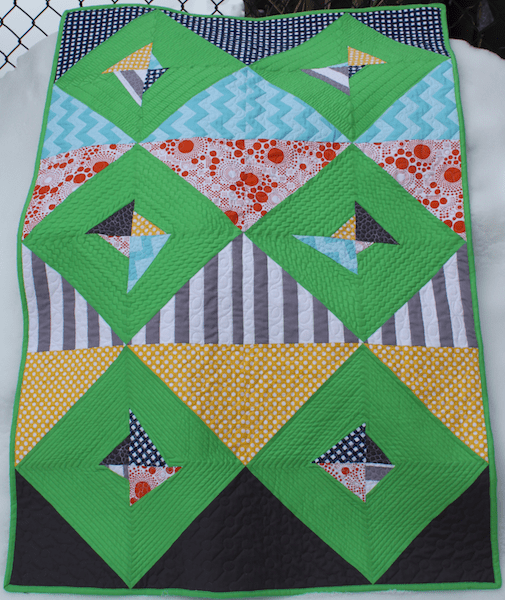 The Modern Quilt Guild announced the 4th annual MQG member’s fabric challenge. This year Michael Miller Fabrics is the sponsor. The fabric is from their new collection called Petal Pinwheels. The rules are super easy: use all or some of the line, add a solid or another Michael Miller fabric and make something quilted. That’s it! So, why is so difficult to make decisions? 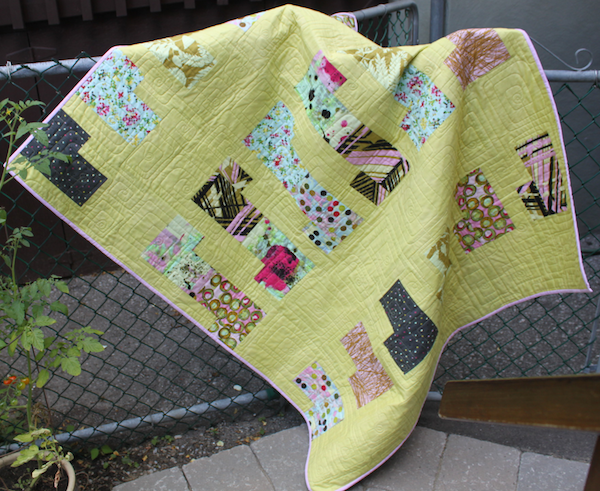 I’ve participated in 3 other Modern Quilt Guild fabric challenges and they were challenging! Not in the piecing and quilting necessarily, but narrowing my focus in order to decide what I wanted to do. I determined that I would try something different with each challenge – a new technique, a new block, or a new free motion quilting design. I also decided to use only the amount of challenge fabric provided and to ‘shop’ for additional fabric from my stash. This adds another layer of complexity to the process! Riley Blake sponsored the 3rd annual MQG members fabric challenge . 6 fat eighths from the Basic category were sent out. The rules: make anything quilted, use any solid or other Riley Blake print. With this challenge I set out to try two new things. I had just seen a demonstration on making half-square triangles and decided to make the biggest half-square triangles I could with the fabric I had! I also tried different free-motion quilting designs in each of the sections. I am happy with the results. I could see improvement in my quilting from the first block I quilted to the last. With the Jay McCarroll Habitat Challenge I chose a solid from my stash that I loved. I had purchased the end of the bolt of this particular yellow/green fabric and had a limited quantity. That plus the challenge fabric resulted in this: Urban Habitat. I like the Habitat fabric pieced with the solid. I used a light pink to bind it. The top was long arm quilted by Sandy Lindal in an allover design. The angular shape of the quilting with the occasional spiral gives it a modern look. The MQG challenge in 2011 was sponsored by Robert Kaufman. You can see many of the quilts from the challenge here. My quilt, Sunday Morning was created with the Robert Kaufman Kona Solids 5” charm packs. I added a creamy white solid to act as the sashing. This was the first time I sewed an entire quilt top using fabrics from the same manufacturer and I noticed a difference in the piecing. Since all the fabrics were the same, it sewed together beautifully – no fudging required! 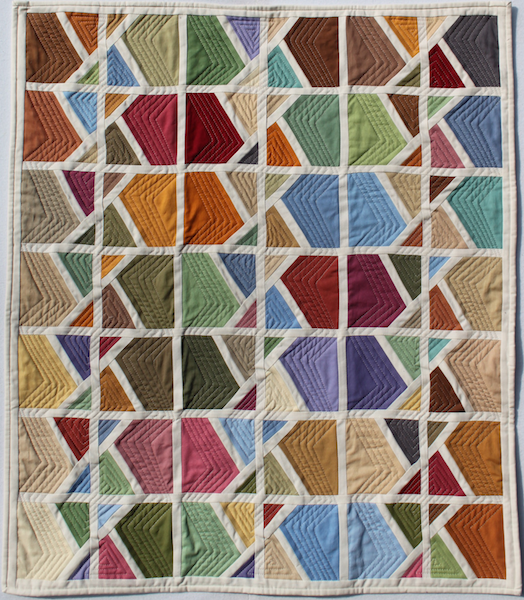 My husband suggested the name – he said that the quilt looked like stained glass windows. I machine quilted this one and am not entirely happy with the look of the quilting. I would quilt the top differently if I were to remake this quilt. How many of you use fabric challenges to try new techniques? In many ways it is liberating to work on a challenge quilt. There is less of an emotional attachment. This could be because the fabrics are donated and the quilt is not being created for a specific person. Fabric Challenge Quilts allow me the opportunity to stretch my technical and design skills without pressure. Some of my most interesting pieces of work come from answering the question: What if…?